Lock in a great price for Hotel Onda Verde – rated 9.4 by recent guests! 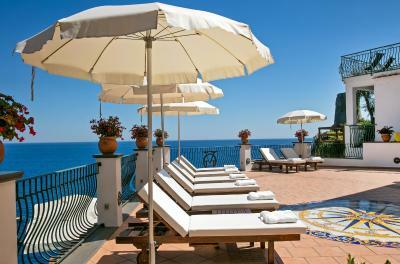 Hotel Onda Verde is a beautiful hotel along the amalfi coast in Praiano. The Hotel is right along the coast with access to sand/gravel beaches; however, those beaches have several beach side restaurants so not private. 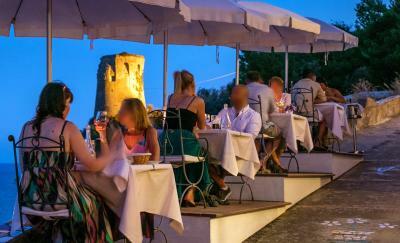 The attached restaurant has sea side tables indoor and outdoor for great views during sunset. 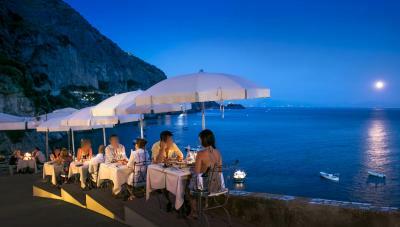 The layout of the hotel afforded a constant view of the ocean and the beauty of the coastline. 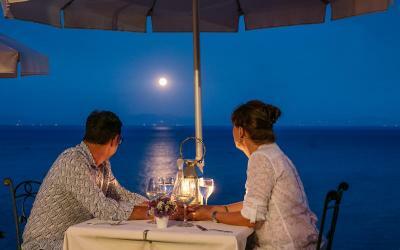 We dined one evening on the balcony with the full moon on the water and it was magnificient. The hotel is beautiful, spotlessly clean; the staff, friendly and helpful. The breakfast buffet was outstanding with a wonderful variety of choices, fresh fruits and sweets, appealingly displayed. The atmosphere of the hotel is peaceful and relaxing. Where do I start... I was fortunate enough to enjoy the hospitality of the Milano family in 2005 at their fabulous property. It is hard to believe, but it's only gotten better. I don't have enough words in English to express myself. 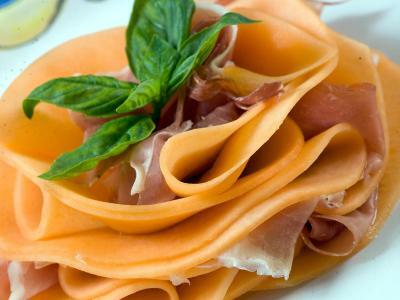 In Italian simply "Buonissimo'. Thanks for a wonderful stay and fabulous meals. Special thanks to a fabulous restaurant staff. Anna (not in photo) Michaele, Marco, Tomaso, and Hillary. A beautiful hotel. 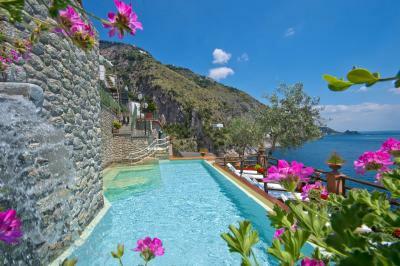 Centrally located on the Amalfi Coast. We stayed in a Deluxe room with a terrace and the view was amazing. The room beautiful and comfortable. The staff was friendly and helpful. Breakfast was very good. We also ate one night in the restaurant and the food is good. They have parking which is essential if you are with a car. 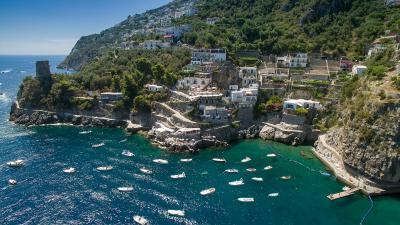 Also there is a possibility to take a water taxi to Positano or Amalfi and even to Capri. 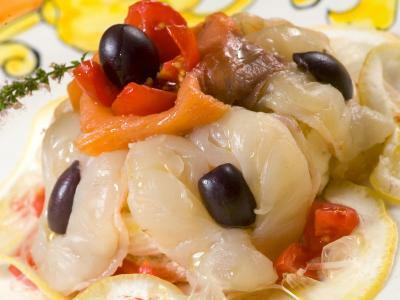 And a few good restaurants within walking distance. Overall wonderful! 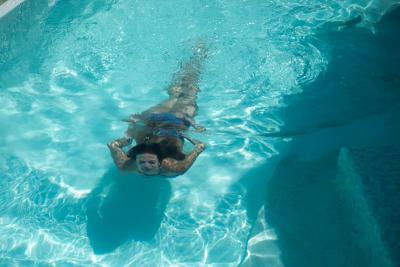 I would definitely return to Onda Verde. The gentlemen that greeted us was warm, kind, and very knowledgeable about the area and provided wonderful recommendations. The room had a really nice sized enclosed patio with patio chairs that allowed us to sit, sip prosecco and watch each sunset as well as the activities of the harbor. 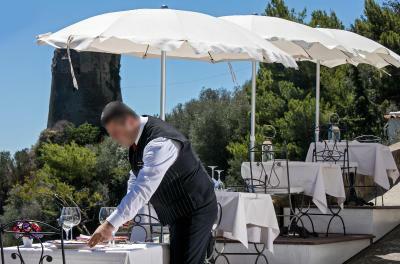 We had breakfast each day and lunch once and dinner once at the restaurant, which was of very good quality. We booked and received excellent massage from the Five Star Massage team, which was awesome and I hope they continue to offer their services as they were excellent and the rooftop massage was a wonderful experience. Parking was easy and safe, the cave walkways and facility decorations were very nice and there is easy access to the water taxi, kayaking, and yacht tours. 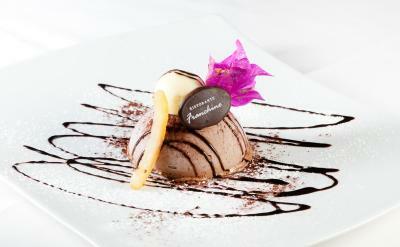 Beautiful location, excellent rooms and wonderful staff in the restaurant. 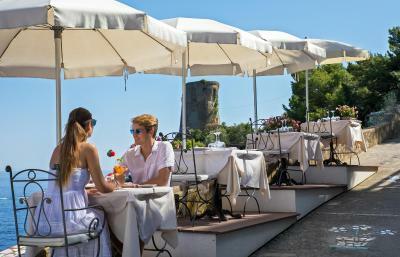 The place was unique with a wonderful terrace and magnificent views. They arranged all our transfers daily which was very helpful. 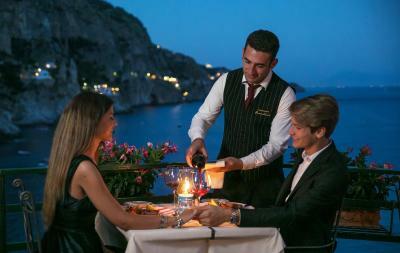 We dined all five nights with them and the staff was beyond helpful. Everything about this property lived up to our lofty expectations. The scenery and hotel are even more beautiful than the pictures do them justice, and the staff was incredibly friendly and helpful throughout our stay. Perfect place to relax, take in the sights, and plenty of great food options in and around the hotel. Hotel Onda Verde This rating is a reflection of how the property compares to the industry standard when it comes to price, facilities and services available. It's based on a self-evaluation by the property. Use this rating to help choose your stay! 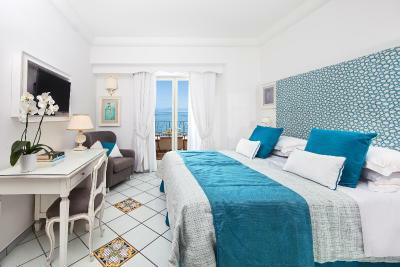 One of our top picks in Praiano.Hotel Onda Verde is a few steps from the beach and the cliffs that lead down to the Amalfi Coast in Praiano. 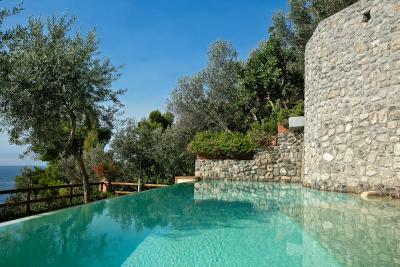 Featuring an outdoor swimming pool, the property is surrounded by lush Mediterranean gardens. 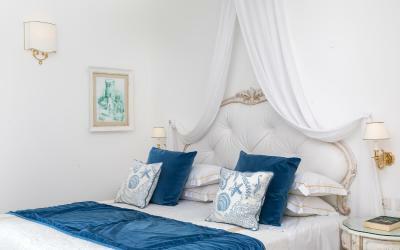 The hotel consists of 5 independent villas, offering air-conditioned rooms with free WiFi and panoramic views. 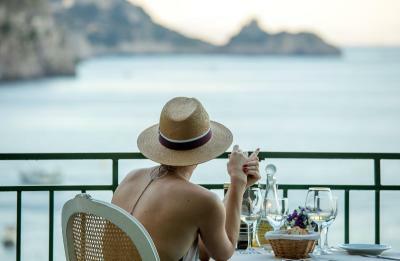 Some rooms come with a sea-view terrace. Free from October 13th to April 19th, the Onda Verde has on-site parking. Just underneath the hotel guests will find a landing-stage for boats to Positano and daily excursions to Capri and Ischia. A elevator is available from the main road to reception and all rooms. 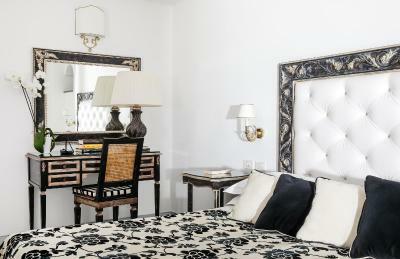 When would you like to stay at Hotel Onda Verde? 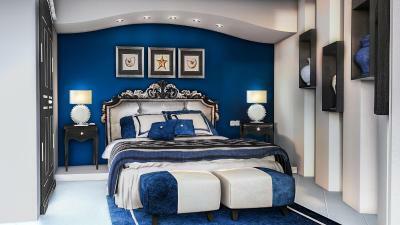 Finely decorated room with a private bathroom and handmade furniture. 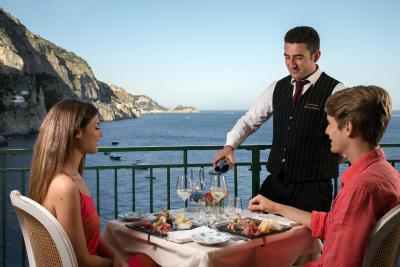 The balcony or terrace offers views of the Amalfi Coast. Features air conditioning and free Wi-Fi. 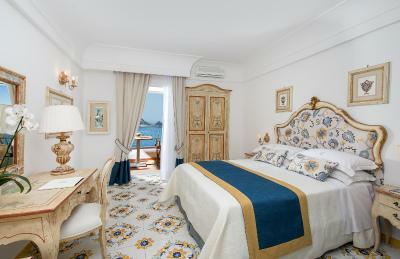 Private room with floors in antique hand-painted majolica from Vietri. 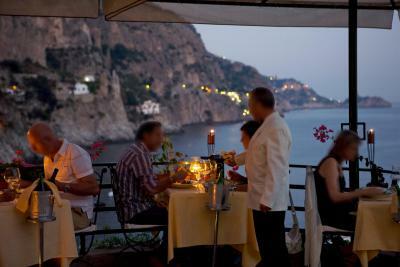 The terrace has a full view of the Amalfi Coast. 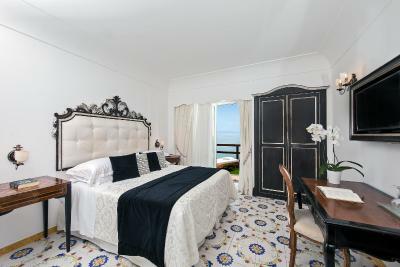 Private room with views of the Amalfi Coast from the window or balcony. Features include air conditioning and free Wi-Fi. Private room with air conditioning and free Wi-Fi. Has access to a common terrace with views of the sea. Room with attached bathroom in a private villa offering a large window overlooking the garden, air conditioning and free Wi-Fi. It includes a mini-bar and a safety deposit box. Please note this room is at the top of a staircase of about 20 steps. Offering a skylight window, this unit features a satellite TV, a private bathroom and access to a private sea-view terrace, 49 feet from the room. 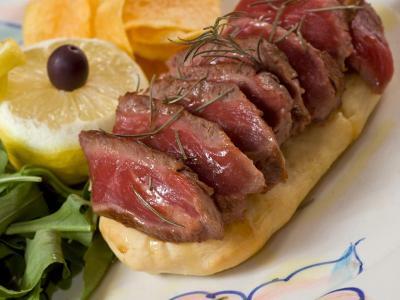 House Rules Hotel Onda Verde takes special requests – add in the next step! Hotel Onda Verde accepts these cards and reserves the right to temporarily hold an amount prior to arrival. Please note that the property offers direct access to the public beach, but sun umbrellas and deckchairs are not included. 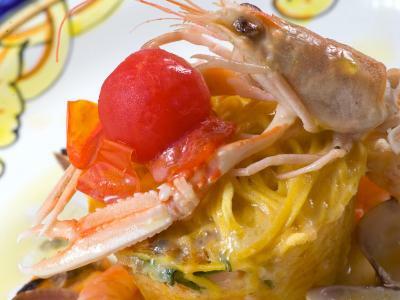 Very good breakfast, especially for Italian standards. Staff was extremely friendly and helpful. The views from the breakfast area and the room were amazing. 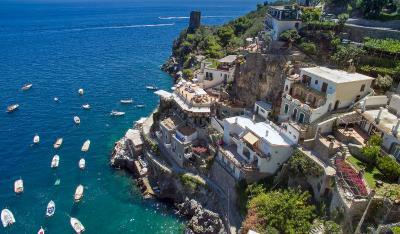 Location is incredible and good bus links to Amalfi and Positano. Really good breakfast selection with something for everyone. Staff were so helpful. Wonderful hotel with excellent service. Great location and beautiful views. Highly recommend. We drove to the hotel from naples which did afford some great views of the coast, but can be fairly stressful due to the frequent turns. We would recommend dishing out for a taxi if you don't like driving. 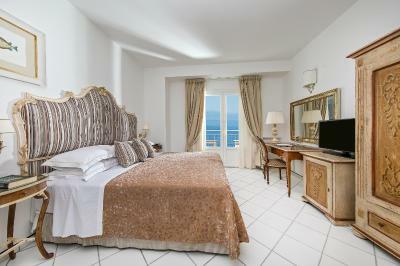 Beautiful hotel in a great location, close to the beach with a beautiful view. wonderful facilities and friendly staff. The bathroom while beautiful, had nowhere to place toiletries, makeup, etc nor hooks to hang items need after showering. The fixtures that were there were too high to be useful. 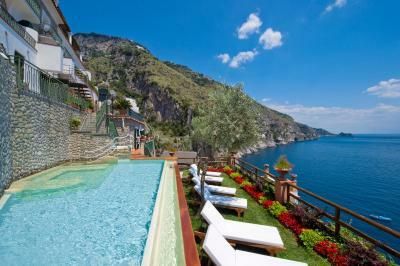 Because the hotel clings to the cliffs of the Amalfi Coast, there are stairs involved to get around. Not an issue for us - we needed the exercise to work off all the great food, but might be a concern for some. 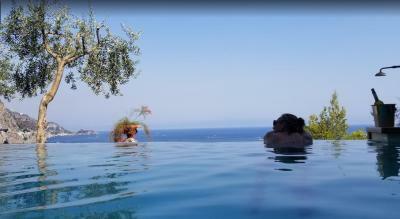 The view was gorgeous, the room was clean and comfortable, the staff was friendly and helpful. A very plentiful buffet breakfast is included in the rate. The view is outstanding! Our room had a nice terrasse with sunbeds from which we could watch the sunrise. Definitely recomended! 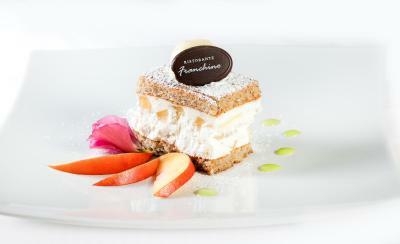 Breakfast is buffet style with a limited selection of warm/ hot dishes. Some of the pastries felt like they weren't fresh that day, but not a huge issue. The location of the hotel is simply stunning. 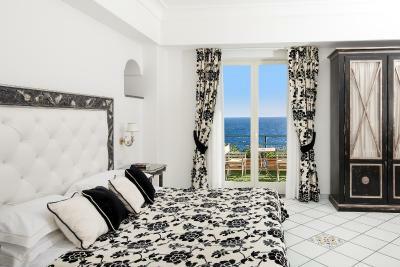 Built on a cliff edge you have uninterrupted views of the ocean and small beach. 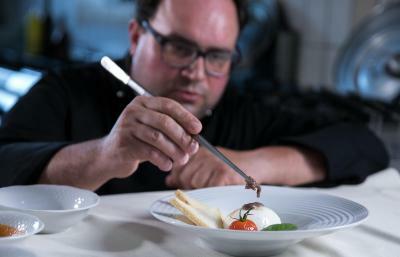 Cleanliness is impeccable and the decor is beautiful and classic but relatively new in comparison to other places you will find in Italy. Rooms and bathroom both decent size and the staff could not be more accommodating. Terrace and pool area is breathtaking, with small bars below and round the corner. It was the perfect location and would go back in a heart beat. The hotel has the most beautifull location. The hotel in itself is crafted in a rock that goês down until the water and the views are breathtaking. The little beach down in the Marina di Praia is a jewel. Breakfast is super, the staff nice and helpfull. 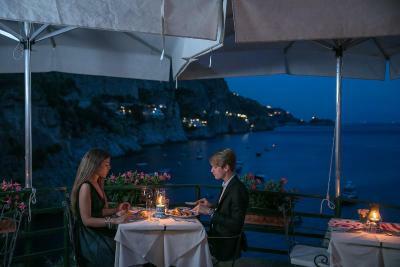 We specially enjoyed the restaurants down in the Marina, Il Pirata and “Da Armandino” were great spots for dinner after a day out and about in the Amalfi Coast. 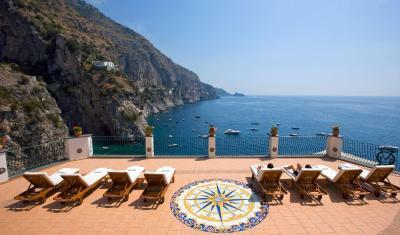 We specially recomendo this hotel also because Praiano is a more quiet and authentic than Positano or Amalfi.